The SMART 600i6 is the merging of two technologies: A SMART 600 series interactive white board and the SMART UF70 or UF70W projector. This projector and white board are widely used in education institutions, particularly K-12 classrooms, and SMART is a favorite manufacturer of white board systems around the world. The reason is that SMART has developed a system that is interactive, easy-to-use, and that delivers great multimedia performance. The 600i6 board/projector set-up is an upgrade compared to previous 600 series iterations. For starters, the UF70 is an ultra-short-throw projector, with a throw range of just 25 inches. That throw is half as short as the UF65 – meaning it can be placed much closer to the screen, while achieving similar results. That option makes this ideal in the classroom, because it can greatly eliminate the cast of images. It also means that you can use a lower wattage bulb, since you are closer to the screen and require less brightness to achieve a brilliant image. The lower wattage bulbs also burn less hot, and thus last longer. Plus, the UF70 projector has a range of compatibilities. It can be used with 600, 800 and M600 series SMART interactive white boards, and it can be adjusted using the projector’s shifting capabilities. Thus, it’s a useful option for school districts, because it can be merged or retrofitted into existing systems. In all, the UF70 in the SMART 600i6 system is a powerful projector and the perfect presentation tool in classrooms. 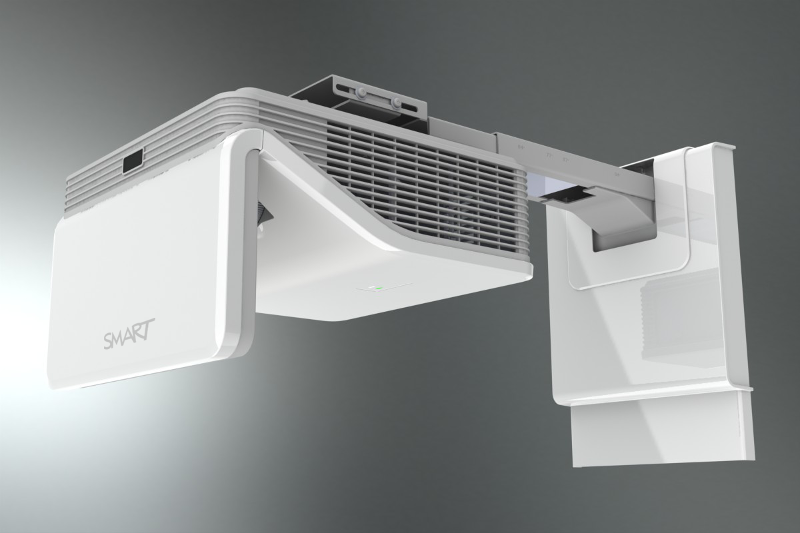 The biggest difference between the SMART UF70 and previous SMART projectors is the throw range. The current SMART lineup, which includes the UF70 and UF80, are ultra-short-throw projectors. This means that the distance the projector needs to be placed from the screen is half the distance – just 2 feet from the screen – compared to earlier SMART projectors. This greatly reduces shadowing caused by a teacher standing in front of the light source. 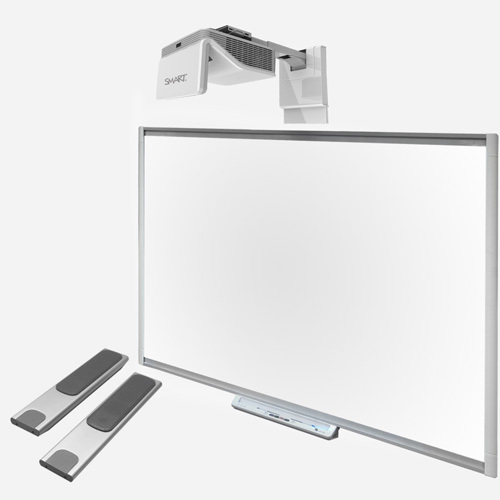 SMART interactive systems are different than traditional classroom projectors. For one, they’re bought and sold as a system, with the board, projector and accessories included in the package. That’s why it’s difficult to review just the projector. In that case, the UF70 does its job well. It delivers crisp, clear images from the computer onto the screen. Pictures – thanks to color perfecting technology – are vibrant and rich with detail, and the projector’s video performance is useful. Although this projector won’t replace a Full HD video set-up, the video features work nicely for short in-class clips, or for showing the occasional classroom movie. Plus, the interactivity is extremely engaging for students. If you’re considering an upgrade, the UF70 and 600i6 offer many benefits over the previous UF65 projector – including a brighter image (2,000-lumens vs. 3,000 lumens), better contrast (2,000:1 vs 2,900:1) and a shorter throw range (the UF70 is half as short). MyProjectorLamps is your source for a SMART 600i6 replacement bulb. We carry original replacement lamps for the 600i6 – replacement part No. 1020991 – which includes the SMART lamp and housing module. Start shopping for a projector replacement lamp today.